Tea is said to be discovered in 2737BC by Emperor Shen-Nung in ancient China and has become one of the beverages that most people drink nowadays. The most remarkable achievement in the Taiwanese tea history is that John Dodd exported Taiwanese Oolong tea to the United States and Europe in 1860’s under the name of ‘Formosa Tea,’ which was reputed as ‘Champagne among teas’ and was said to be given the name of ‘Oriental Beauty’ by the British royal family. The prosperity of tea industry had gradually died down since 1980’s. However, Yilan, the location of Lanyang Campus, is one of the tea areas in Taiwan that work hard on tea renaissance. 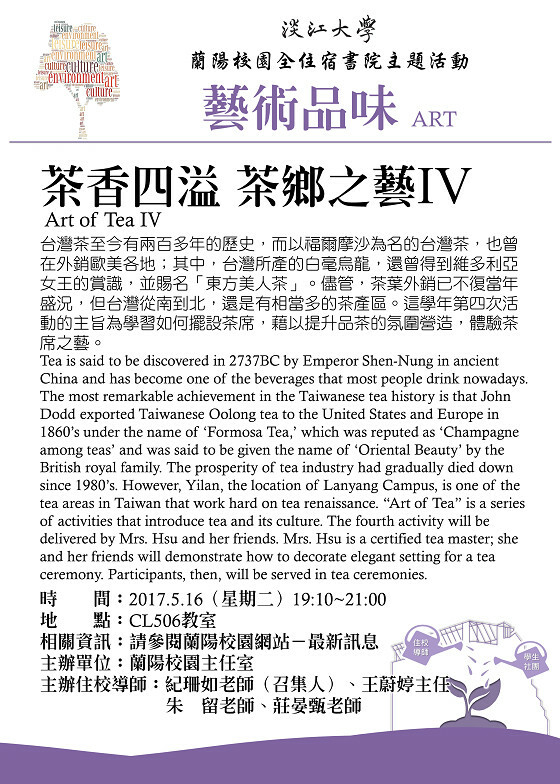 “Art of Tea” is a series of activities that introduce tea and its culture. The fourth activity will be delivered by Mrs. Hsu and her friends. Mrs. Hsu is a certified tea master; she and her friends will demonstrate how to decorate elegant setting for a tea ceremony. Participants, then, will be served in tea ceremonies.